Little kids will love showing off these cute Trick or Treat baskets as they scour their neighborhood for candy. Of course you want your preschooler to have a great time on Halloween, even though he or she isn't ready for Zombie Apocalypse accessories or vampire fangs drenched in blood. Luckily there are Halloween Trick or Treat baskets that are designed with younger children in mind. 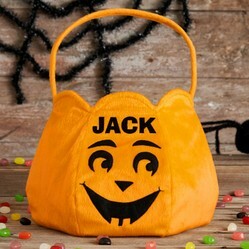 These cute-as-can-be personalized Trick or Treat bags and baskets are cute and cuddly. All children this age love things with their name on them. Each of these products can be personalized with a name or nickname. Smaller children won't have any problem carrying them as they search out the best treats in town. The Spooky Plus Halloween Basket have the added benefit of reflective faces to help keep your child safe. You can coordinate the basket with your toddler's witch or vampire costume. Candy Corn bags go well regardless of the costume that the child is wearing. Everyone loves a jack-o-lantern this time of year. Filling it with candy just makes it even more fun. There are eight different adorable plush Halloween bags for you to choose from. Each can be personalized with the child's name (up to 9 characters). The Spider has large round eyes and long yellow legs that come out from the top. Children will love the Vampire with his cute up turned red ears and little white fangs. They will gently tug at the Bat Bag with orange bat ears. Squealing like a pirate will come naturally they see the bright white Pirate treat bag that looks like a skull and crossbones. Smiling faces will appear when they see the giant smile on the Jack-o-Lantern treat bag. Children will want to hug the Frankenstein Halloween Basket. He couldn't scare anyone with his soft exterior. Kids with cats will love the Black Cat plush bag. The friendly little witch in her pointed hat will be loved for years. CLICK HERE to get the details and to purchase from Personal Creations. It doesn't matter what costume your child wants to wear, a Candy Corn treat bag will work with all of them. No other candy or treat is associated more with Halloween than Candy Corns. Just seeing the yellow and orange stripe combination is enough to make our mouths water. These giant Candy Corn Halloween bags measure 10 inches long and 8 inches wide. Any name up to 10 characters can be added to the yellow top layer. Take a close look and you see that there are four different funny faces to choose from. A yellow and orange striped handle lets any child keep their candy sash safe! CLICK HERE to order a Candy Corn bag from Personal Creations. Even the smallest toddler learns quickly that jack-o-lanterns mean Halloween. They'll love carrying this soft Halloween bag that will look like the fancy pumpkins they see on almost every step. Names up to 9 characters long can be added above the jack-o-lantern face. The soft plush bag holds a lot of candy. It's generous size measures 10 inches wide and deep and 8.5 inches high. Made from durable polyester, it's easy to clean after a busy Halloween. Since it goes with any Halloween costume, it can be used more than one season. Make it one of your child's favorite Halloween traditions. CLICK HERE to buy it from Personal Creations. Give your guests a Halloween punch worthy of the night. You can start with a festive Halloween Punch Bowl and then add eyeballs.